An awe-inspiring place, Thailand has something for everyone. If you're an adventure junkie, you'll probably find yourself bungee jumping, SCUBA diving with sharks, or taking Muay-Thai kickboxing classes. If the wilder side of life isn't your cup of tea, don't despair – between elephant riding, Thai cooking classes, and the world's most exotic beaches we're confident you'll find more than enough to keep you happy. 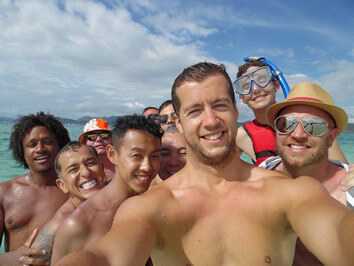 As one of the most gay-friendly destinations in the world, Thailand is an opportunity to feel completely comfortable being yourself while experiencing a whole new side to life. Thailand has that exotic, mysterious, exciting appeal to it. Just hearing the name "Bangkok" can send shivers down people's spines, and the allure of the country's jungles and mysterious culture is almost overpowering. 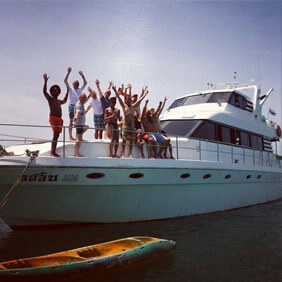 Thailand is the Mecca of adventure, carefree living, and open-mindedness. There are fewer inhibiting rules or Western nonsense here, and the Buddhist zen-like culture makes the country one of the happiest places on earth. Our 12-day trips have been designed to maximize your experience. Instead of rushing around in a panic trying to visit as many places as possible, we've specially chosen four locations that we know you'll fall in love with. How are we so sure? Well, we've spent years in this country tirelessly testing out beaches, bars, bungalows and bit of booze just to make sure we can bring you the cream of the crop. Elephants, monkeys, massive palm trees, boat taxis, pineapple fruit shakes, beach bbqs and Thai massage are all elements of the experience in Thailand that make each moment so enjoyable. In a world that is changing so fast, Thailand is a beautiful reminder of a place where simple living can still be the key to happiness. Another great thing about traveling in Thailand is that a little bit of money goes a long ways. A complete Thai (or Western) meal will normally cost $2 - $3. A beer at a bar or restaurant will cost $2. T-shirts are only $4 - $5! And every day in Thailand offers opportunities for some sort of life affirming adventure - like world class rock climbing, scuba diving, jungle trekking, swimming, boat trips, caving, tubing, and more. There are also Thai cooking classes, $8 massages, yoga classes, bamboo tattoos, temple visits, fire spinning, or just simply chilling out on a wonderful beach with a group of friends. As the Thais like to say – "up to you!" Going on a Detours trip means that you can be involved in as many fun activities as you like…or as few as you like. If swaying in your hammock with a good book and letting the day roll by is what you're in for, then so be it. Each day presents something new, so slow down and soak up the moment in a way that most Western people rarely get the chance to do. Thailand is jam-packed full of opportunities to keep active, whether it's excitement you're looking for, cultural experiences, or checking out the stunningly unique flora and fauna. Listed below are just a few of these opportunities in each of the locations we visit. Our unhurried travel concept gives our travelers enough time to take advantage of as much (or as little!) as you like to make this your trip of a lifetime! Note that some of these activities are seasonal so there's a slight possibility of an activity not being possibile during your trip. ** - Trip prices based on twin share. Traveling solo? We'll match you up with another solo traveler at no extra charge, or just pay a $690 single supplement for your own room! Our 12-day adventure starts and finishes in the metropolis of Bangkok, the capital city of Thailand and home to Asia’s best food, nightlife, and shopping. This incredible trip will be spent on the islands and beaches of Southern Thailand and with the animals and ruins around Central Thailand. Most travelers will arrive in Bangkok on day one and head to our meeting spot for our 4pm start of our adventure on this day. This time in Bangkok is a great introduction to the incredible country of Thailand. During these couple days, we'll really get to know the city by checking out Bangkok's highlights using local tuk-tuks, boats, and trains. 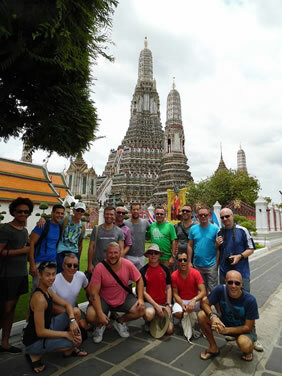 On our second day, we'll take a guided day-trip around the city visiting Wat Pho, Wat Arun, and more. At night we'll head down the street to check out Silom's famous night market and very lively gay scene. Bangkok is world famous for many reasons and never disappoints her visitors. Bangkok is just one of those cities that words can’t come close to describing. With everything from the food to even the smells of the city a never-before-experienced sensation, it’s no wonder this place has made a name for itself worldwide. This was our introduction in Thailand when we started running Thailand trips over a decade ago, and where we fell in love with everything Thailand. Bangkok is Thailand's hub of shopping, business, history, culture, and of course food. It's not uncommon to see an elephant walking down the street while you sample a deep fried cricket from a street vendor "just to say you did". Our first full day in Bangkok is our "get to know the city" day with a local Thai guide. We'll stick to local transport to get around the city and stop to check out temples, a palace, street markets, and even a view over the city. Every Detours trip will begin and end here, and will give you enough time to get a real taste of what this city is like. Day 3 brings us to southern Thailand with a quick 1 hour flight and short 15 minute boat ride to the jaw-dropping cliffs and white sand beaches of Railay. 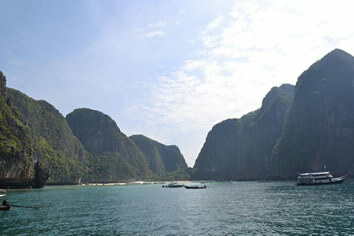 An idyllic paradise surrounded by the perfectly blue waters that have made the Gulf of Thailand famous. Railay offers hidden lagoons and caves for hikers, beaches for sun-worshippers, and plenty of opportunity to eat great food and meet people from all around the world. Stay on land, or jump in the water for some snorkeling, or SCUBA diving fun. Railay is the Thailand you’ve seen in many Hollywood movies. Incredible cliffs rising out of white sand beaches, with waves of perfectly turquoise waters lapping the shore. It’s an unforgettable car-free paradise, full of the kind of real authentic Thailand that we love. Everything in this secluded community is walkable, including FOUR beaches, a hidden lagoon, caves, a beautiful viewpoint, and several local barefoot beachfront restaurants. The dramatic limestone cliffs here are world famous for rock climbing adventurers, the surrounding islands and waters are perfect for water-loving explorers, and the long stretches of white sand beaches are perfect for soaking up plenty of vitamin D with a drink in hand. If you’re not a fan of boats don’t worry, it’s only 10 minutes from the mainland pier to get here. Long enough for a scenic trip away, and short enough that you’ll have the sand between your toes before you know it! Join your trip leader here on a hike to the hidden beaches and caves, take a snorkeling trip out to the islands, relax on the beach… it may be removed from city life, but there’s plenty to keep yourself entertained in this iconic piece of Thailand. 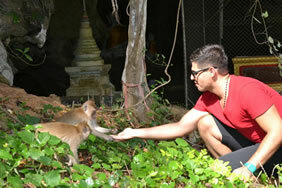 On day 6 we travel just 3 hours overland to the well-known resort and nightlife city of Phuket. It’s here you’ll find opportunities to feed wild monkeys, island hop, or get some sun on the local gay beach by day while socializing with people from all over the planet by night. Phuket is popular day and night and has tonnes of options for both early-risers and late-nighters. Get your shopping done, check out a cabaret show, relax on the beach, take a cooking class, spend the day at the spa... it's beautiful place to unwind... or windup. Phuket is world renowned for its amazing beaches, SCUBA diving, nightlife, food, outdoor activities, and pretty much everything you look for in a tropical destination! Whether you're in the mood for hitting the local white-sand gay beach for some eye candy, or immerse yourself in the hustle and bustle of Patong, you're in luck! 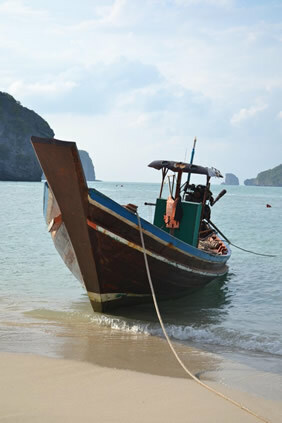 Our favorite activity to do with our groups is an island hopping day trip out to the Phi Phi islands for the best snorkeling we've ever experienced, as well as stunning limestone cliffs, and the afternoon on the roadless paradise island of Koh Phi Phi Don. 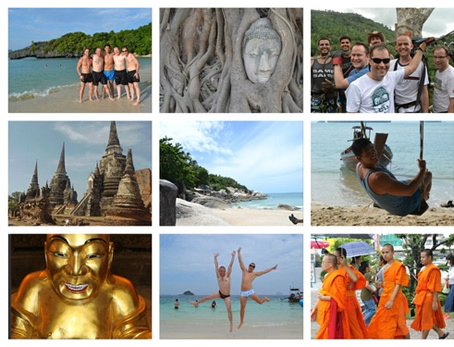 Our days here are generally pretty busy, given the number of amazing opportunities that Phuket presents us! Back to Bangkok! We fly one hour from Phuket to Bangkok for your chance to stock up on some new outfits or some souvenirs for your boyfriend/mother/bff. With a city as large as Bangkok we've got lots to explore here before our next couple days of day trips! We start this day trip by taking a 90 minute ride from Bangkok to the formal capital city of Thailand, Ayutthaya. Here we are hosted by a local Thai guide who will show us the incredible 14th century ruins of this once royal city. Beautifully preserved, these ruins are an amazing showcase of Siam's turbulent history. After our full day of exploring the Ayutthaya area, we head back to into Bangkok for the night. Once the capital city of Thailand, and only 1-hour away from the current Thai capital of Bangkok, Ayutthaya is a stunningly preserved 14th century city. The ruins of the temples are still on display today and give an impressive look into the once-booming city 700 years ago. The Thai-style chedis still rise up over the city, the Buddha statues still watch over the grounds, and even the black soot still shows where the Burmese burned the city hundreds of years ago. We're not the only ones that like these ruins either, UNESCO thought these ruins were so incredible that made them a UNESCO World Heritage Center! Our day in Ayutthaya will start with a drive from Bangkok to Ayutthaya where we'll go on an informative and private guided tour of the temples. We bet it'll beat any history class you've ever taken! We'll have lunch in Ayutthaya town, wander around the many temple ruins, and make sure you've got lots of profile-picture-worthy photos before we head back to Bangkok in the evening. This is our animal day! We support the ethical treatment and interaction with animals and fully support the works of the Wildlife Friends of Thailand project. We spend a full day at their remote wildlife refuge property, 2.5 hours south of Bangkok feeding, walking and washing elephants, meeting several different species of unique monkeys, bears, and all kinds of exotic creatures! This day will not just allow us the opportunity to get face to face with flying squirrels, jackals, langurs, gibbons, and more, but will also allow us to learn through their stories. We return to Bangkok for our final night together on this night. Our full day experience at Wildlife Friends Foundation of Thailand has been designed to allow us a chance to learn about the rescued creatures living at the Wildlife Rescue Centre and Elephant Refuge, see hundreds of animals, and get up close and personal to elephants in a way which is cruelty-free and does not exploit them. There are too many ‘attractions’ where tourists unwittingly contribute to the suffering of animals – elephant riding, and posing with animals for photos are just a few examples – but WFFT offers the chance for visitors to see rescued animals in a responsible way, free of cruelty and where the animals do not suffer as a result. The best option to learn about Thailand’s beautiful and abundant wildlife is a visit to WFFT to learn everything there is to know about wildlife conservation and animal welfare in Thailand. It's goodbye-for-now day as the trip comes to an unwanted end in Bangkok. Make one last made dash to MBK mall for some last minute shopping if your flight time allows it, then it's time to pack up your bags and head back home. Don't worry, Thailand will be waiting for ya when you come back! All travelers are welcome to book their flights departing from Thailand at any time on the 12th day. Don't worry about getting chilly, Thailand is a tropical country and the areas that we travel in are warm day and night. High temperatures of 35C/97F, and lows of 23C/77F can be expected through most of the year. Even if it rains it's usually in the afternoon, and these unlikely showers are a refreshing cool-down and make a great excuse to try out your favorite rain dance. Thailand is home to some of the most amazing food on the planet, and it's cheap too! Detours doesn't believe in limiting your choices by including meals at pre-decided restaurants as part of the trip package. Instead, we encourage you to explore all of the different restaurant options available to you. This way you can eat when you want, where you want, with whomever you want, and spend what you want! Your trip leader definitely has their favorite spots and will be excited to show you all of their favorites in each location, just check with them. Our advice is simple. Pack your bag, then take half of those things out and leave them back home. It's common to hear people wishing they'd packed less stuff, but we've never heard anyone complain that they didn't bring enough. Thailand is a very inexpensive country, meaning even if you realize you forget to pack some crucial item you can just pick it up on the trip for half of what it would have cost back home. Just make sure you've got the basics: speedos and sunscreen. Other than that, not too much else matters. Oh, and there's no need to pack gallons of North American water in your bag just in case there's no fresh drinking water in Thailand… yes, we actually had someone do that. We REALLY suggest just bringing your regular bank card from home and using the Thai ATMs to get cash; in our experience it's much cheaper than any currency exchange service in Thailand or even at home. 1000 Thai Baht is worth around $30 USD, so don't go nuts if your dinner bill costs 100 baht. Relax –that's about 3 bucks. Your 300 baht, hour-long full body oil massage on the beach? Yeah, that cost less than $10. Tipping isn't a native Thai custom, however, it's become a part of what is expected from Westerners like us. We suggest tipping for services in a similar way as you would in North America; that is, if your dinner bill is 100 baht then we encourage you toss 10-20 baht in on top of that. That extra 30-40 cents is extremely appreciated by the Thai service staff. We have pretty high standards when it comes to choosing our accommodations, and trust us, we've done plenty of room-sniffing, pillow-patting, and bathroom inspections to make sure we stay at quality spots. To be approved as a Detours accommodations provider, a guesthouse must: be locally owned (to support the local community), be in an amazing location (close to the beach and other hot spots), have air conditioning (you can thank us later), AND be gay-owned or gay-friendly. We won't be staying in 5-star Ritz-Carltons but we also won't subject you to anything we wouldn't want to stay in ourselves. Clean and comfortable, you can count on that! All of our trip leaders are gay, and all certified leaders must undergo a rigorous training routine that includes deep-fried cricket eating, and impromptu dancing tests. Apart from these vital skills, we require our leaders to know their stuff really, really well. Underneath their fun and quirky facades, our guides are experts about all aspects of Thailand and especially the places we visit. Don't hesitate to ask them to teach you some Thai or question them about a random statue you might see along the way. 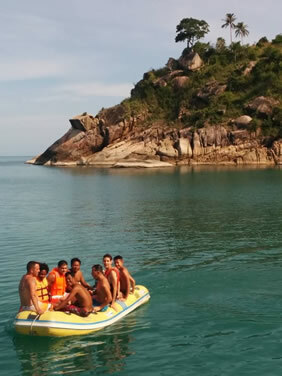 Their job is to help ensure that this is your trip of a lifetime by taking the hassle out of your trip and making sure you experience everything you came to Thailand for. We do absolutely everything possible to avoid needing such a mundane awakening. A world without alarm clocks is one we want to be part of, and your "rise and shine" while in Thailand will come from the sound of crashing waves, an elephant trumpeting, or perhaps even the odd monkey jumping onto the roof of your bungalow. For many people, their 12 days in Thailand just isn't enough time. If you're lucky enough to be able to stay longer, or if you decide to quit your job and become a beach bum in Thailand for the rest of your life, we'd be happy to extend (or cancel!) your return flight. We've been all over South-East Asia, so don't think twice about asking where to go or what to do after your Detours trip is complete. Our Detours groups are run with a minimum of 4 travelers and up to a maximum of 15 travelers. Ages of group members vary but around 90% of our travelers are in their 30's, 40's, and 50's. Whatever the age of the guys on our trips everyone's already got something in common, an exciting new experience in a new country! Each group is led by a Detours trip leader who is there to ensure everything goes off without a hitch, allowing you to focus on having the time of your life! As we've already mentioned, you'll have a tough time finding a more open-minded and accepting country, and most people don't have any issue at all with homosexuality. That said, the Thai are a modest people, and public displays of affection (whether gay or straight) are generally frowned upon. In respect for their local culture we usually suggest keeping your excitement and affection for your partner to more private locations. No problem! Don't worry, our trip will provide plenty of chances to meet great people both inside and outside of our group, including other solos. As far as your accommodations go, you've got two choices. We can either pair you up with another group solo member in a two-bed room, or you can have your own room for a reasonable surcharge. Relax – we won't keep you from updating your Facebook status the whole trip. Every hotel we stay at includes free Wifi and your trip leader can even help set you up with a local SIM card for your phone if you'd like to do that when you arrive too. Thailand uses a "type A" and "type B" plug, the same as North America and several other places in the world. The voltage is 220V with 50 Hz frequency. These days, the majority of items that are plugged into an outlet are built to handle varying voltage and frequency levels, but just to be sure, we suggest checking your item for its accetable range. Further information can be found in your "Trip Preparations" guidebook which will be available to you after your trip signup. However, if you have any further questions about your Costa Rican experience please visit our FAQ page or contact us.